If you’ve gone through GOD’S plan of salvation then you have the HOLY GHOST. That’s all the power you’ll ever need to defeat the enemy. The authority comes from the Word of GOD. We can and should take authority over anything the enemy throws at us. We have the Word of GOD to follow. JESUS tells us what to do. We have the authority of the Word to lay hands on the sick and they shall recover. We can cast out demons in the name of JESUS. We can command the enemy to take his hands off our family in the name of JESUS. We need to say it and claim it in JESUS name. It happened last Wednesday in the home of Russ and Laura. Russ took authority in his house and threw the enemy out on his ear. The imps left because Russ took authority and control of his house that JESUS blessed them with. If you ever feel or if you know the enemy is causing trouble in your house , in your family, with your friends, take the authority of the Word and with the Power of JESUS, command them to go. Authority to heal crippled – for the deaf to hear. For hungry people to be fed. Authority to open blinded eyes – a man blind all his life saw after JESUS put mud to his eyes and by this authority he could see. Authority by HIS word of authority “Lazarus come forth” the dead lived again. This is the authority that’s made available to us when we call on HIS name. JESUS passed this same authority on to HIS joint heirs. That’s every Christian who has that personal, one on one, love relationship with JESUS. It’s time for us to claim that authority JESUS gave each one of us. 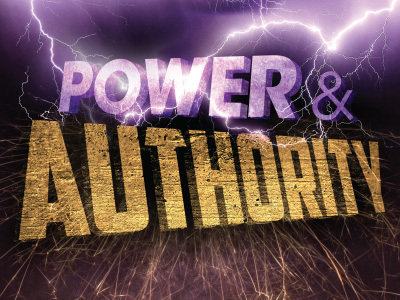 We need to use this GOD given gift of Power and Authority if we’re gonna be Victorious over the enemy.